Wayne Vandenburg was on fire the other night, poking at a plate of enchiladas at a Permian Basin café, serving up 55 years of UTEP athletics for dessert. “Vandies Dandies” were an enormous draw to home meets in the late 1960s. 2 world-record holders and an Olympic champ. Now 77, going on 38, Vandy had started this busy day at his home near Dallas. Making his way west on the interstate, he stopped for meetings in Weatherford, Abilene and Odessa. Next morning, he was headed for Monahans, then driving back to Dallas. Between incoming phone calls from friends and his real estate investment business office in Chicago, the Miners Hall of Fame coach conducted a memory-walk … back to one of those UTEP/Southern Cal/Oregon triangular meets … world-class athletes in competition … the roar of the Kidd Field crowd bouncing off the mountains and rumbling against your chest. Wayne is one of those rare guys who can go full blast into any project, at any time, and never once question his own choices. Most guys like that are insufferable. A two-legged jackass. Case in point: Baseball manager Billy Martin. And that new senator from New York appears to have the same toxic blend of arrogance and ignorance. Not Wayne Vandenburg. Full of energy and optimism — to go with contacts far and wide — I always thought Wayne would have been the ideal athletics director, at a time when UTEP was growing. Who better to capitalize on the 1966 national basketball title and the ’67 bowl victory over an SEC team? Instead, fate went against my wishes, and against Wayne Vandenburg. UTEP Hall of Fame track coach Wayne Vandenburg — forever an optimist and a Miner forever — is always looking up. Vandy in 1970 embraced the very UTEP black athletes he released. Several Miners planned to boycott, in support of protests against racial discrimination nationwide. Vandy sympathized with the message but not the means, and fired them all. Bam. There went UTEP’s chance for another track/field championship. But a few years ago, the tracksters of yesteryear gathered for a reunion, former athletes coming back to El Paso from hither and yon. Hugs and laughter all around, with nary a word of angst to be heard. In a two-way show of loyalty so rare today, Miners with retreating hairlines and advancing waistlines still love Wayne Vandenburg. Can you blame them? What’s not to love? A trainer at Texas Western the year the Miners won the national basketball championship, Fred Schwake now runs an antique shop in the West Texas town of Ballinger. “One man’s trash is another man’s treasure,” so the saying goes. You couldn’t tell it by Fred Schwake. He doesn’t seem to know the difference. Nor does he much care. The former UTEP athletic trainer runs One of a Kind Unique Antiques in Ballinger, where his shop between Abilene and San Angelo trades in everything from jewels to junk. Schwake learned at the knee of legendary Miners trainer Ross Moore, then went on to serve as trainer for the Atlanta Falcons and later the San Francisco 49ers. Since leaving the NFL, his goal has been simple: Buy low, sell slightly higher, amuse his friends. He specializes in aging signs, but cannot vouch for their accuracy. Even one his own signs could be called into question. “The Best Kept Secret in Texas,” declares one prominent sign facing one of the few main streets in Ballinger (pop. 3,767 in 2010 census). This is a gross exaggeration, of course, especially since the Abilene paper recently ran a major feature, with photos, on Schwake and his kitschy business. What is indisputable, however, is Freddie Joe, as friends call him, is the only antiques dealer in Runnels County to be in the National Basketball Hall of Fame. Schwake taped the ankles of Jim Barnes, Bobby Joe Hill and Nevil Shed for Coach Don Haskins when the legendary Miners of the 1965-66 season won the NCAA University Division Basketball Tournament by defeating the Kentucky Wildcats, 72-65. As March Madness begins this week, the Miners remain the only team in Texas to have won the NCAA national D-1 title. A loyal UTEP Miner, Schwake shows off his license plate to salute his friends and classmates on the 1966 championship basketball team. 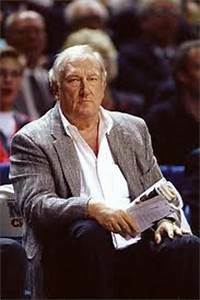 My associations with Hall of Fame basketball coach Don Haskins consisted mostly of watching his practice sessions. At Memorial Gym on campus where the Miners practiced, I once sat with (Western Athletic Conference basketball official) Moose Stubing. Hall of Famer Don Haskins, meaner than an ex-wife, a Miner forever. The contributing writer is true orange, loyal to the University and to many friends in West Texas. Watch this space for Rex Miller’s original illustrations, found nowhere else by “Miners Are Forever.” Next: An insider’s view of UTEP legend James Forbes, who played on the U.S. Olympic basketball team and still coaches kids in El Paso today.